My entry for the Color Throw Down Challenge #376. The colors are pale pink, pale blue and tan. My butterflies are from Inkadinkadoo. I colored with color pencils and added a bit of Wink of Stella to them for some sparkle. I used Spellbinders Shapeabilities Ornate Squares. I daubed the Close To My Heart - blush and sky on to my die cut. Then using a color pencil I scribbled hash marks on the center. 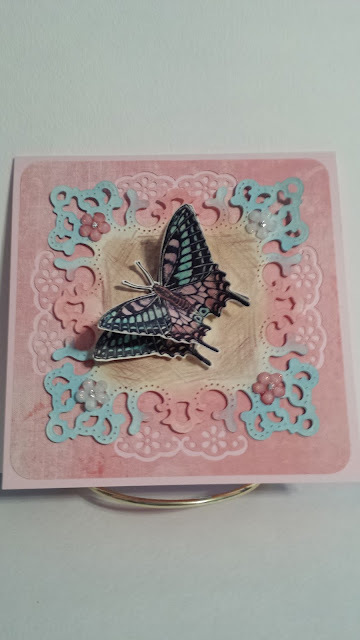 I used a Martha Stewart border punch on a piece of dsp from Glitz paper pack called Love you madly. It's all mounted on dimensional adhesives onto Stampin' Up! Pink Pirouette cs. The little Pastel Flowers are from The Paper Studio. This is such a lovely card and yes...I'm a big fan of Wink of Stella pens to add a hint of sparkle! Thanks for joining us at Color Throwdown this week! Lovely card!! Shiny is always good and love how you incorporated the different cut patterns! So glad you joined us at CTD!